Warning: This post is going to be a bit on the personal side. I know that many feel it good practice to keep posts of a personal nature in a separate personal blog (most notably Rory Litwin over at Library Juice) and I tend to actually fall in to this camp even though I blog a lot about MPOW. So, if this is too personal for a professional blog, you can all blame Karen Schneider. We had a great conversation at the Blogger’s Bash in NOLA and she encouraged me to share a bit more of myself on Library Garden and (in specific) this story. Since I can make this somewhat library-related I am posting it, albeit with some trepdiation. It was two years ago today my husband and I stood before a judge in a Russian court and were declared to be the legal parents of the most precious nine-month old boy who was then living in an orphanage in the City of St. Petersburg. We were finally a family and it was the best moment of my life. As I sit here writing this I am misty-eyed at the memory. I am still in awe 2 years later that this amazing child is our son. Where does the library connection come in? I have spoken at length with Chrystie Hill about the Libraries Build Comminites project she is doing with Steven Cohen and next week Michael Stephens and Jenny Levine will be in Princeton to deliver a 5 hour hours session to a standing room only audience of their popular 4C’s Roadshow — the C’s stand for Conversation, Community, Connection, and Collaboration”. The words community and connection being key here. There is a buzz in the profession about libraries building and transforming communities and a part of the library 2.o movement extends that to creating connections online. But, there are still skeptics (I have met them and there are more than a few) who have yet to experience meaningful connection in an online community and have a hard time believing that the connections established virtually can be as meaningful as those established In Real Life (IRL). I have a story to tell related to the adoption of our son and it is a story about the power of online community and of transforming that virtual connection in to something meaningful IRL. Perhaps my story will help convince the skeptics. I will try to keep this brief, but the story is long so forgive me. In Jul 2003 my husband and I decided to make our dream of becoming a family a reality by adopting and after much soul-searching we felt that Russia was our destiny. One of the first things I did was sign up with several adoption-related virtual communities and online forums. I joined to seek information and in the end found the best support network that I have ever had in my life. If I had not joined these virtual communities and found suport during our long and arduous adoption process, I am not sure I would have made it — and I really mean it. 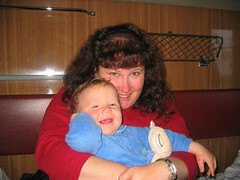 We received a referral for a beautiful baby boy in February 2004 and made our first trip to meet our son in early April. We were told we would be back in about 4 weeks for our court date. We got home and 2 days later, before we had unpacked, we got a call saying that we should come back in 10 days. On April 19th we went to court and everything fell apart. The details are not relevant to this story, so lets just say that we got caught in the middle of a political struggle and our adoption proceeding was halted after one of the most confusing and agonizing hours of our lives. It was devastating and there was nothing we could do to it change before our visas expired, so we ended up spending our wedding anniversary flying away from Russia and every mile across the Atlantic was another mile between us and our son — a little boy whom with whom we had already bonded and who had a nursery waiting for for him back home in NJ. It was then that I experienced the power of virtual community. My online friends, several of whom lived in NJ and had become IRL friends by this time, rallied behind us even though we had known them for but a few months. They understood in a way that no one else could what we were feeling. They knew the raw emotion of going to court in Russia where adoption proceedings can and often do go on for hours. They could understand like no one else the shock of despair at having the proceedings halted. They understood how this baby boy was already fully our son in our hearts if not our home. Those that had made the journey to Russia or were in the middle of it understood the emotional and physical investment and were able to support us like no one else could. Our family, friends and colleagues tried their hardest and were a big help, but it was the online community that got me through some of my deepest moments of despair. Every single day without fail I got an IM, email or phone call from one of my “forum friends” — they made sure of this. When I was having a hard time functioning, they kept me going. One friend sent me the poem “Kisses in the Wind” and I ended up repeating that poem every night for it allowed me keep believing he would come home. My husband and I did not give up, though some told us we should. We knew he was meant to be our son. We filed appeals, jumped through hoops, redid paperwork, and did everything else we could so that we would be allowed to go back for another court hearing. At times we were told he would never be ours, but we couldn’t give up. Finally, 10 weeks after we stood in court for the first time, we got “the call” that we had another hearing and a mere 9 days later we were on a plane to Russia for the third time. Our 2nd court hearing was surreal and nothing like the first — it was like being in the twilight zone. I actually don’t remember much as I was just hoping I wouldn’t pass out from nerves, but I will always remember the moment when the judge returned after what seemed like an eternity from deliberations and declared us finally to be the parents to the child of our hearts. The sadness of our long months apart faded and only joy remained. It is incredible to me that two years has gone by since that day — it seems like so long ago and just yesterday all at the same time. July 14th is a day we celebrate in our house as “family day” and it is now one of my favorite days of the year as we do something special as a family — just the three of us. The friends that I made from a variety of virtual communities are some of my closest friends IRL to do this day. Many live in NJ and we get together frequently for special occasions and regular play dates. Two of the children in our group from NJ share an even closer connection with my son — all 3 were born within 3 weeks of each other and they all spent the first nine months of their lives in the same room at the same baby home. These 3 happy active toddlers were in a Russian orphanage together as infants and now they are growing up together in NJ thanks to the power of online community. Okay, this is the longer than I thought it would be but I don’t how to shorten it and describe the impact that online community had on my life. I feel like I should draw some insightful conclusions, but at this point I want to mostly let this post stand as a tribute to power of community and connections — and to the little boy that I just kissed while he slept soundly in his crib… the same boy that I used to blow kisses to in the wind and whom I feel blessed every day to have in my life. Happy family day! We got caught up in the great Chinese slow-down of 2002 and it seemed like the referrals would never come. The online community was an important support during those days, our group even sent lunch to our agency during the week we expected our referrals so they wouldn’t have to take time out to eat! Thanks Janie. I came to the blog for librarianship and was touched by your story. I also have an “online community” and “Russian adoption” story. When my son was born, I was part of an online board that shared our pregnancies and what was happening in our lives with our children. After three years, one of the mums adopted a little girl from Russia. For months, I heard of the ups and downs of her adoption process. One of the most touching parts was that when they took her to her new playroom, she looked at all the toys and touching each one said in Russian “For me?”, “For me?”. Thanks for reminding me. Our stories are what make us who we are. There is no reason you should not be comfortable sharing them. Many blessings on your Family Day. Your story is wonderful–and one that underscores the power of virtual communities. It’s the kind of story we should take into account when we’re thinking about services for our users. It was so good to meet so many of the “garden” in New Orleans! hi janie, i am so glad that you shared this story here on your blog. of course, we’ve been blessed with your voice (and powerful stories) over at WJ for a long time now (two, three, ten years is it?) i agree with jane that our stories are powerful. keep it up, girl!